You decide: Who should be the new BallinEurope logo? Should “Pau” be retired? Sooner or later, it had to happen. With Ramunas Siskauskas – half of BallinEurope’s logo – now retired from the professional ranks, the icon (or possibly icons; more on this later) of this website must change. And so today we’re asking the question at top, i.e. Who should be the new logo? We’ll be running a poll on this question next week, but please feel free to put forth suggestions in the “comments” section below this post. A few suggested guidelines: Since the winning choice will be immortalized (well, as immortalized as things can get online) in illustrated form, BiE asks that you consider only guys easily caricatured or are at least easily recognizable by the uniform. After making a few kneejerk-reaction choices, BiE also consulted with this site’s contributing writers and a pilgrim father of BallinEurope. Below runs the tentative list of candidates thus far. • Juan Carlos Navarro – the easy choice put forth by Marko Savanovic and yours truly; the only concern here would be about the remainder of La Bomba’s career. In how many years will BallinEurope have yet another new logo…? 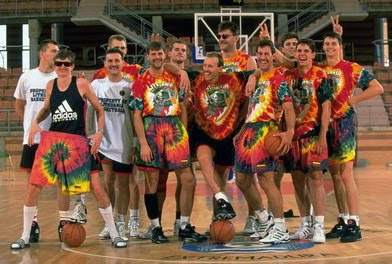 Amen to that and also to the fact that any of these three younger guys would make excellent logos – cartoon Valanciunas is definitely getting geared up in the Team Lithuania tie-dyes, member of the ’92 team or no. And here’s one other question for your consideration, per Cellini’s suggestion: Should “Pau,” a.k.a. The Smoking Man, a.k.a. The Bearded Guy, also be retired to make way for a second new player caricature? Please bear in mind that “Pau” is not literally intended to be Gasol-of-the-Lakers, but is instead a general European baller icon. BallinEurope will run an actual poll of five or six of the top candidates and best suggestions on this subject next Monday, but for now, weigh in on both questions below. Who will be the next Ramunas…? Minnesota Timberwolves bullets: How good are these guys?FIBA’s new international tournament rules: Capitulation, silent collusion or just plain selling out? I say have one retro player and one current player…..
No one on that logo ever lost to NIGERIA. It should be one European player that is in the NBA and one European player that is in the Euroleague. From Euroleague it should be the best player, which is Vassilis Spanoulis. From the NBA I think it should be an up and coming player, as Pau, Parker, Dirk and guys like that are in a steady decline. So I would go with Rubio. So, it should be Ricky Rubio and Vassilis Spanoulis. As 80% of articles talk about the living youtube clip, Ricky just has to be on the logo, there is no doubt about it. i would love to see Dirk, as he is veery easy to carricaturise, even if his career ends, he was one of the main players in the rise of european ball in the nba and the world! but the idea to have an european from nba and a euroleague player is also nice as it connects the two main fields of that blog, europe and europeans!! so maybe ricky and teodosic or an established older guy as erazem, spanoulis but please not two spaniards. I like the idea of one Euroleague player and one NBA player. I also think the NBA player should be a certain player from BiE’s adopted team – a solid import from Europe, who’s already in the top 10 in the NBA at his position… Nikola Pekovic! Awwww yeaaaaaaaaaaah! hehe and the tatoo of Pek would be the highlight of that carricature 🙂 I like the Pek idea! I like the one NBA and one Euroleague player, but I would open it to just 2 players that are European and have played in either league. From current NBA I vote for someone like Gortat, Batum, Pekovic, Rubio, Marc Gasol. I would stay away from again the older players that seem to be winding down. From current Euroleague I vote for Spanoulis. I would also like Navarro, but sadly I think his career is winding down due to health, so it would not make sense to pick him. Same with Diamantidis. So I say go with Spanoulis. I would not mind seeing Pekovic and Spanoulis – two guys with beards. Some guys for Euroleague to that have not been mentioned, Ioannis Bourousis, Rudy Fernandez, and of course someone like Big Sofo. Big Sofo cartoon would be great. Just thinking about it, cartoon characters of Pekovic, Sofo, and Spanoulis would be great. No mention of Alexey Shved? Maybe Tony Parker and Spannoulis or Teodosic? No doubt – Erazem Lorbek. I think Lorbek deserves being in the logo. He has been a first option for both Barcelona and Slovenia, and has been very consistent in past 5, 6 season. Juan Carlos Navarro – Nice option, but I agree, with your thoughts … He is not so young anymore. • Bo McCalebb – Beside Navarro and Lorbek, he is the best option. • Ricky Rubio – Maybe, but still not convinced. • Nicolas Batum – Fourth best option. • Erazem Lorbek – FOR SURE! • Dario “The Next Big Thing Out of Croatia” Saric – Hasn’t showed anything yet. • Jonas Valanciunas – Not a chance. Being that the site is a out ball “in” Europe, as you said, an American playing on Europe should be one of the two — Bo is the best choice here (or Anthony Parker for the nostalgic option). Europeans playing in he NBA doesn’t seem to fit the bill to me — they are the exact opposite of what the site says (Europeans that voluntarily left Europe to play somewhere else when they would be very welcome to play in Europe if they chose). The second person can be whomever the best European is right now — I am not as keen on the Euroleague as others, so ill choose from your list: Teodosic. It should be Ricky Rubio as an european doing good in the NBA and Schortianitis. For the “new addition” of BiE logo it would be “my prerogative” to use Bobby Brown. Bobby Brown……………..LMFAO at this troll gabe. Dude, STFU. I really only said him so I could make Bobby Brown jokes but he is leading Euroleague in points and index ratings and is the only player in the league to be selected to two Euroleague Weekly MVP awards so far so it is not too much of a stretch if BiE wants to use a player who currently is really “balling in Europe”. Gabe has proven that he deserves a ban. Suggesting Bobby Brown for this is beyond the pale of trolling, even for Gabe. It is the equivalent of suggesting that Brandon Jennings should replace Jerry West on the NBA logo. Gabe isn’t just a troll – he’s blasphemer. He has taken trolling to the point of trying to outright infuriate and enrage European basketball fans at this point. Bobby Brown? Seriously, he earned at least a 2 week site ban for that. Yes. Wake me up when Jennings is leading the NBA in scoring like Bobby Brown has made it his perogitive to do in Euroleague. So a guy that in his whole life has played 3 good Euroleague games should be the ballineurope logo? Can someone please tell me why this site is cursed with the malignancy known as Gabe? What did this site do to deserve this awful plight? If Bobby Brown appears anywhere on that vote, I am done with this site. Guys, guys … i’m pretty sure Gabe was just kidding when he suggested Bobby Brown. Although that would be quite the interesting choice … nah. BallinEurope, the European Basketball news site » Blog Archive » Poll: Which European NBAer should be in the BallinEurope logo? Frantic-Celeb: Celeb Gossip, Music Rumors, TV News, Hollywood Scoops, Sports News, and MORE! » Poll: Which player in Europe should be in the BallinEurope logo?